TNFUSRC Recruitment 2019: Tamil Nadu Forest Uniformed Services Recruitment Committee / www.forests.tn.gov.in is conducting recruitment processes to fill 564 vacancies. As of now, there is one recruitment drive going on for Apply Online for 564 Forest Watcher Posts. TNFUSRC Forester Recruitment 2018 - Apply Online for Apply Online for 300 Forester Posts (included in the Tamil Nadu Forest Subordinate Service) in Tamil Nadu Forest Department. Online Applications are invited by Tamil Nadu Forest Uniformed Services Recruitment Committee from 15 Oct 2018 to 05 Nov 2018 05:00 PM for 300 vacancies. TNFUSRC Forest Guard Recruitment 2018 - Apply Online for 878 Forest Guard Posts (included in the Tamil Nadu Forest Subordinate Service) in Tamil Nadu Forest Department on direct recruitment basis. 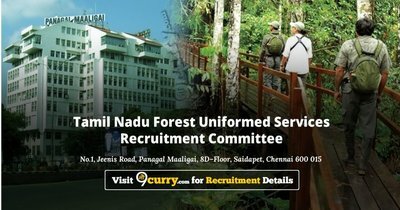 Online Applications are invited by Tamil Nadu Forest Uniformed Services Recruitment Committee for from 15 Oct 2018 to 05 Nov 2018 05:00 PM for 878 vacancies.